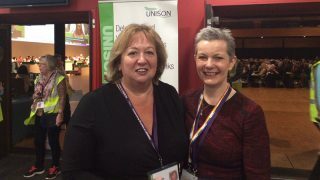 Escalating violence and aggression towards NHS staff is having a ‘catastrophic’ effect on their physical and mental health, UNISON health delegates heard today. A motion on protecting NHS staff against violence and aggression noted that in England more than 70,000 NHS staff were assaulted in 2015/16, up 4% from the previous year. New figures to be revealed by UNISON and HSJ on Tuesday, for 2016/17, will give even more dramatic results. Similar levels of violence are reported in the devolved nations. These assaults can have a “catastrophic effect”, the motion states, not only due to the physical impact of the injury, but also the long-term psychological impact. Traumatised victims can take many months to recover. Attacks include needle stick injuries, bites, spitting and sexual assault. In the early 2000s the government launched its ‘zero tolerance’ campaign and created NHS Protect to take a national role in reducing violence and aggression. But despite the year-on-year increase in attacks, NHS Protect ceased to operate in April 2017, leaving no national body charged with protecting NHS staff. 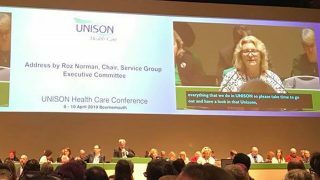 Proposing the motion, Linda Hobson of the health service group executive, told delegates: “I started nurse training a few years ago and was shocked and surprised by how much violence and aggression was targeted at NHS staff. Ms Hobson added that the effects of cost-cutting on waiting times for patients and their families “leads to extremely stressful situations that means staff are more vulnerable to attack. Amanda Sweet of the Northern Ireland ambulance branch said that in November 2017 there were five assaults on her colleagues reported every week. But she felt that figure didn’t give the whole picture. Not all staff report crimes, for reasons that include humiliation, embarrassment, anxiety about repercussions from their attackers, and the fear of being accused of inappropriate behaviour towards a patient. At present, local NHS organisations have been left responsible for dealing with violence and aggression, but without the leadership and strategic oversight that comes from a national body. Anyone expected to undertake restraint as part of their role must receive adequate training to do this safely. Delegates today debated a number of other motions focussed on the daily pressures on health staff, including workplace stress caused by staffing shortages and long hours, the numerous drawbacks of hot-desking, and the under-funding of mental health services that has had negative repercussions for both staff and patients.